For the first time, VOD and EST business exceeded that sale and rental of physical media (DVD and Blu-ray) in Belgium during 2014. According to figures published by the Belgian Entertainment Association (BEA), based on research by GfK, electronic sales and rentals (all forms of VOD) have reached €130 million, an increase of over 16% compared to 2013. During the year, DVD sales fell 21% to €95.7 million. Blu-ray never really caught on, during the past year sales dropped nearly 15% to €19.7 million. 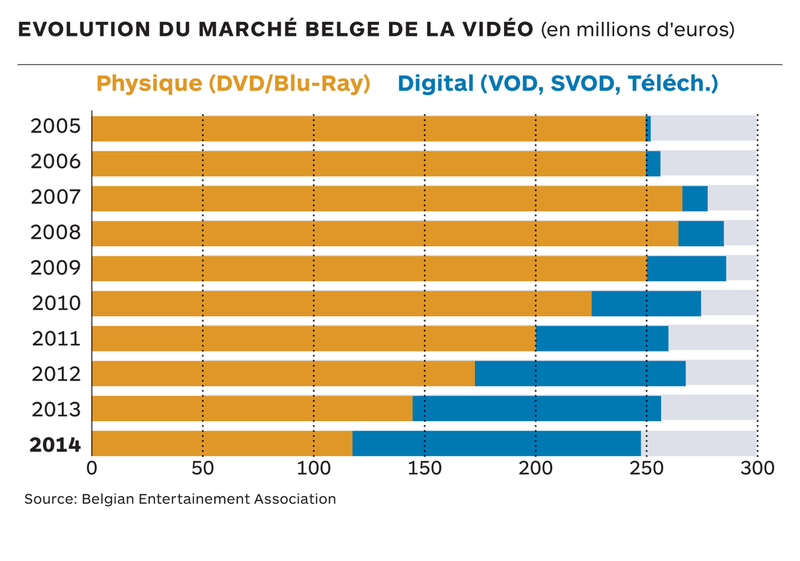 By volume, the Belgians bought 7.62 million of DVDs (down 24%) and 1.28 million of Blu-Ray (down 10.4%). Despite the growth of VOD and ESTm the total video market is slowly contracting, going down 4.3% during 2013 to €245.4 million.